Let's look inside. Maybe it's a disconnected cable like most forum will suggest. Until now, it looks good. 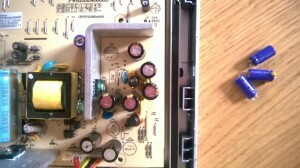 Let's look at the electronic board. Found it !! 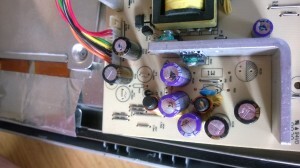 Three capacitors are dead. (The 3 purple ones). It's noticeable by the little dark liquid that escaped from the safety valve. 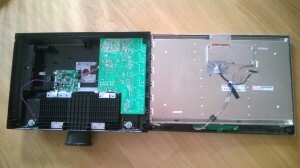 Either I replace the entire board, EMAX PWR1002406003, that cost ~40€ online or try to replace the 3 capacitors rated 1200µF 16V.